Our roundup of the best Rome hotels with pool, to find relaxation and shelter from the Italian summer sun! I always say that, if you can, you should avoid visiting Rome in summer. However, I know that this is not always possible, especially if your travels are tied to school holidays, so today I am sharing a list of the hotels in the city with pool, the ultimate weapon to beat the summer sizzle in the Eternal city! As you will see, the selection of hotels on this page leans heavily towards 5 stars establishment and this is not by design. In Rome, mostly for the layout of the city in its central area but also for the high demand of accommodation, there are very few city centre hotels equipped with outdoor spaces and pools. The only ones that do have such availability price themselves at the very high end of the accommodation spectrum and you start seeing more affordable prices only compromising on location. To create an article useful to as many travellers as possible, this is my selection of hotels in Rome with a pool including some in areas that fall outside my first choice of the best place to stay in Rome for location. I believe that, in the summer months, this compromise can be worth it, especially if travelling with your kids who may find the heat of the Roman summer hard to take. I hope you find this selection of Rome hotels with pool useful. This is a fabulous hotel in the upmarket district of i Parioli, famous for its elegant streets and aristocratic fees. Leafy and residential, this area is immediately outside Rome city centre and it is perfect is you are looking for a relaxing stay and don’t mind using public transportation or taxis to move around. This is a beautiful, family friendly hotel with a pool perfect for the whole family as well as couples and solo travellers. The proximity to the zoo makes it an excellent upmarket option for families with young children. On a different side of Villa Borghese from the hotel above, Parco de’ Principi is another 5 star hotel in the heart of the elegant Parioli area. On the edges of the park and with excellent connections to Via Veneto and Rome city centre, this is a great choice for people looking for a great hotel in Rome with a pool in a green and residential part of the city. 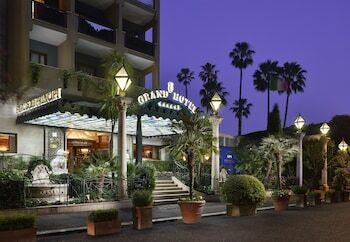 A swimming pool but also a wide garden to relax from the busy Rome streets makes the Gran Melia hotel an absolutely outstanding choice families looking for a great hotel in Rome with a pool. This family friendly hotel in Rome is located in the Vatican area, outside of the city centre, but still in an excellent location, and is a true oasis in the middle of the city. Housed in the historic Villa Agrippina, its grounds are vast and well equipped with resort style pool, several dining options on site and full concierge service. The hotel is family friendly and the junior suites offer extra living space, perfect for larger families. Perched at the top of Monte Mario, this is one of Rome’s historical hotels famous for stunning views over the city. This hotel is a favourite for business travellers but it is also welcoming to families thanks to its family rooms, large outdoor spaces and the offer of babysitting / childminding services. Just in front of Termini station, this hotel as a very convenient location close both to the city centre and the main transport hub of the city from where trains, buses and taxis depart. On arrival, you are likely to be underwhelmed by the road the hotels opens onto but don’t let it deter you. The interior of the hotel however is beautiful and they have great amenities such the bar with great views over the city, a spa and fitness centre and of course a pool, on the rooftop with an adult and children area. In a gorgeous location, a stone throw from the Colosseum and Rome city centre, the Hotel Mercure makes the most of this stunning location with a scenic rooftop terrace overlooking the city and equipped with the outdoor swimming pool. This hotel is in a peculiar location. While it is outside of the city centre and required the use of public transport to reach Rome’s main landmarks, it is immerses in the green space of Villa Doria Pamphli, Rome’s largest green space, meaning it feels very much like a green oasis of peace. I am fond of NH hoetls and this one is no exeption. Located outside Rome city centre, a bus ride away from the city’s main landmarks, this hotels has well appointed rooms, a terrace, a fitness centre and a large outdoor pool. 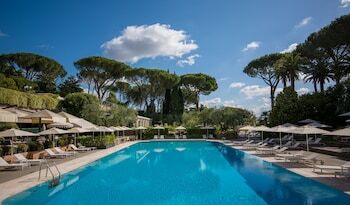 I hope you found this roundup of the best Rome hotels with pool useful. Safe travels to Rome!